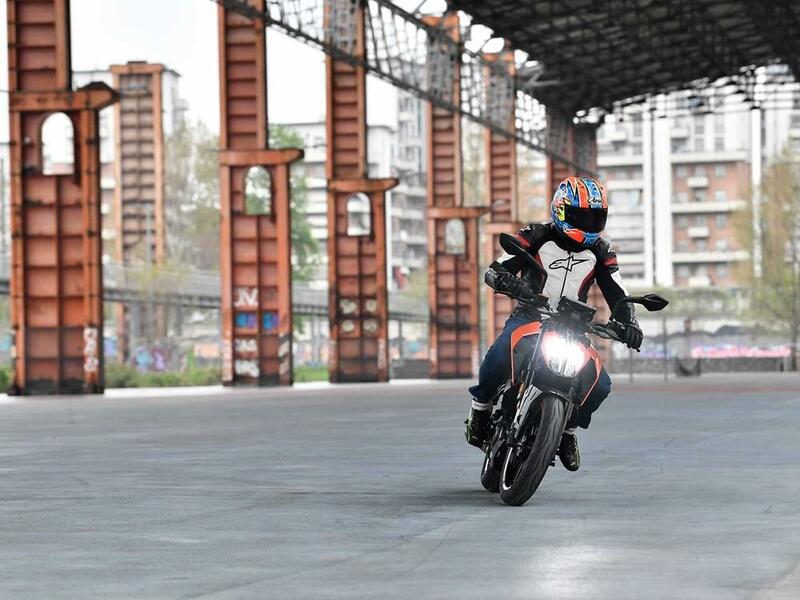 KTM has given new riders something to smile about with its 2017 KTM 125 Duke. The original 2011 model didn’t exactly have quality written through it like a stick of rock, but this one does, thanks to a major makeover, including engine tweaks, a new chassis, quality cycle parts and a full colour TFT dash. After six years of the original 2011 design, it was aging and lacked the quality of its rivals. 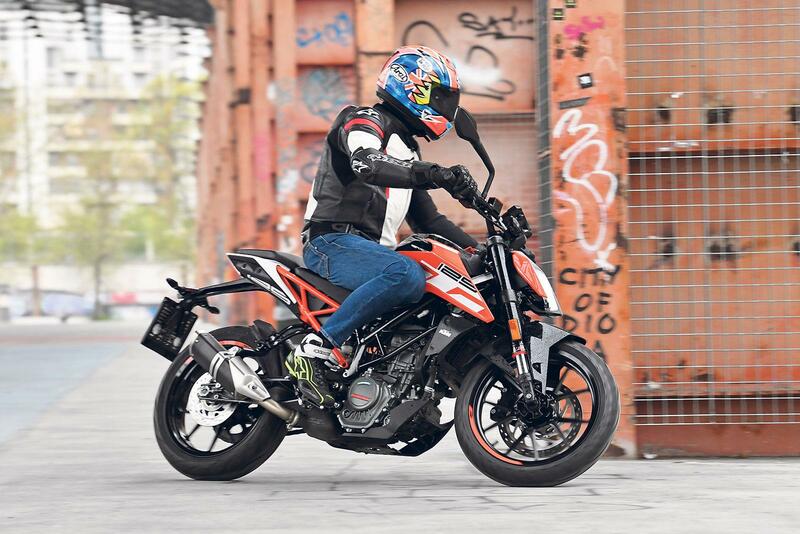 Taking styling cues from the mighty 1290 Super Duke R super naked, this new machine has been revitalised with modern touches that give it that desirability factor it so desperately deserved. Updates include the afore-mentioned TFT dash, illuminated switchgear buttons, an LED headlight and a new exhaust. There is now also a larger fuel tank, non-adjustable WP suspension and a four-piston radial caliper up front. As well as styling updates, the 124.7cc single cylinder engine has been brought into the modern age and is now Euro4 compliant, offering a wider spread of power than the previous bike’s lump. These alterations mean the new 125 Duke exudes quality. It also offers you that big bike feeling, thanks to a roomy riding position capable of accommodating taller riders, without feeling intimidating to novices. KTM have turned this bike into a real rival-beater. Compared to the rest of the 125cc crop (Yamaha MT-125, Aprilia Tuono 125, Suzuki GSX-S125, Honda CB125R), it offers a crisp, well finished package that others struggle to match. It also injects new hopes into the longevity of motorcycling, giving teens an exciting low-capacity bike to aspire to – something unseen since the head banging two stroke Aprilia RS125. On the move, the 125 feels like a well put-together package. The gearbox is slick and the WP suspension feels sporty and well sprung, unlike most soft and wobbly 125s on the market..
A new chassis has helped KTM sharpened the handling and steering. 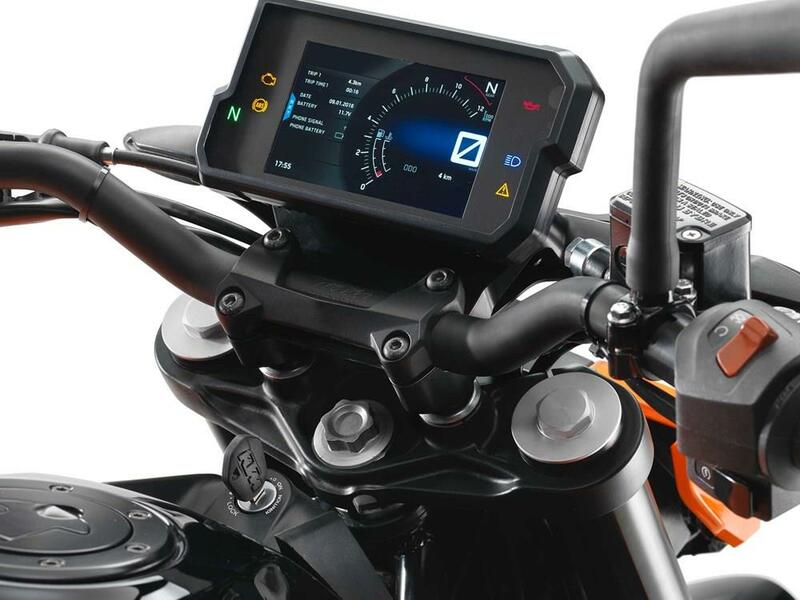 The steel trellis frame, which now has a bolt-on subframe and a KTM 690 Duke look-a-like lattice swingarm, has racier geometry and a slightly more canted-forward riding position that shifts more weight on to the front end. 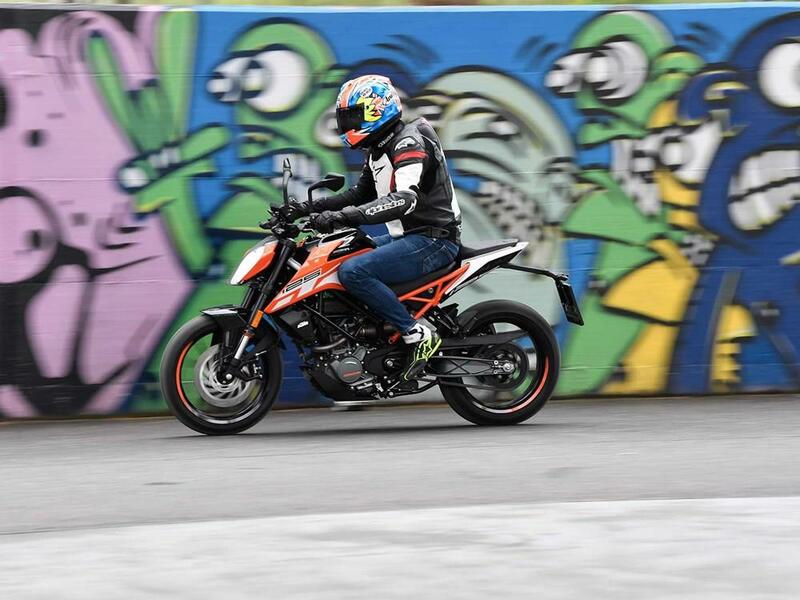 As a result, there’s extra feel for what the front tyre is doing in the corners, but the KTM is still roomy, comfortable and with its straight bars, still has an aggressive, supermoto feel to it. Adding to the sense of big-bike quality is the new non-adjustable WP 43mm upside down forks and single rear shock, which gives the 125 Duke a more controlled ride. The Duke’s A1-licence-friendly 15bhp liquid-cooled, single-cylinder 124.7cc motor has been breathed on for 2017 to meet Euro 4 regulations and the old underslung exhaust makes way for a new side-mount item. The engine offers ample performance for urban riding and, thanks to a dry weight of just 137kg, has more than enough power to stay ahead of the traffic. Only time will tell if the new 125 Duke will be more durable than the original, which suffered some reliability and quality issues. The new machine’s level of build, paint finish and quality of components is much improved, so the signs are good. Unlike many 125s the Duke is solid, crisp and has the same roomy, big bike feel as the KTM 390 Duke. The gearbox is slick, the brakes strong and the new WP suspension is nice and sporty - not the usual budget wet mush mixture of cooking-oil-damping and biro-spring support you get on your average 125. You can buy a new 125 for a quarter of the price of a new Duke, but you’re not going to get a machine built with the same attention to detail and level of quality. The 600 mile first service for the MCN long termer cost £250, but the bigger service needed between 4,000-6,000 miles can be nearer the £400 mark. Front brake 300mm disc with Bybre four-piston radial caliper. Rear brake 230mm single disc with single-piston caliper. KTM launched the hugely popular, Indian-built 125 Duke in 2011. With big bike ergonomics and small bike weight, you could scrape your pegs and knee sliders with relative ease. The original lasted five years until the 2017 model replaced it. 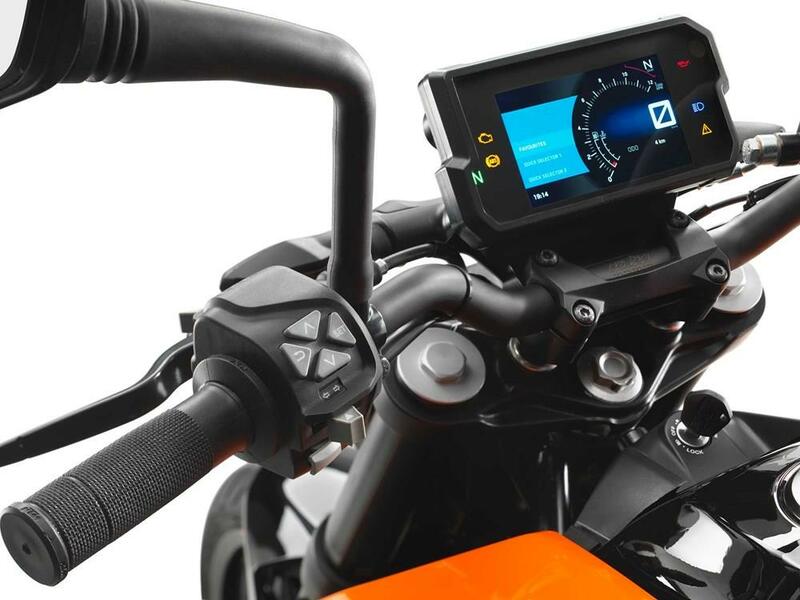 The A2 compatible KTM 390 Duke is the big brother to the 125. 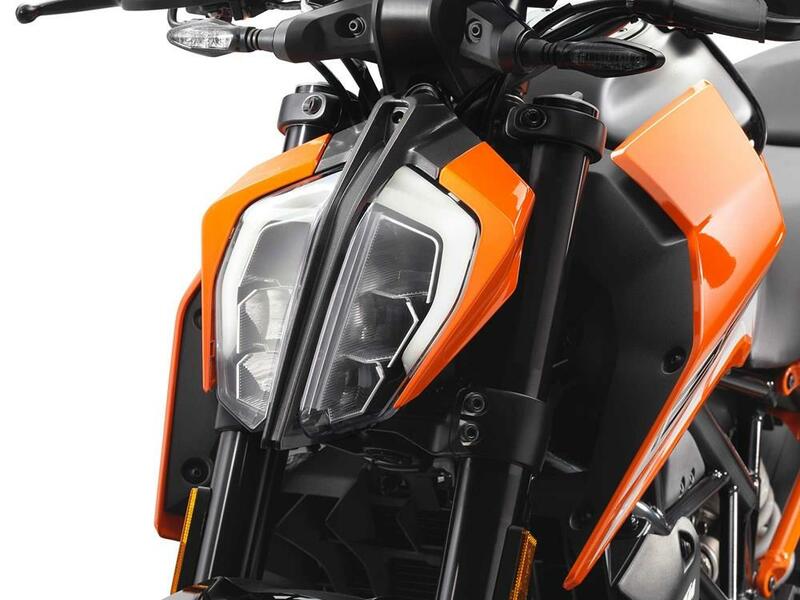 It too takes its styling cues from the KTM 690 Duke. 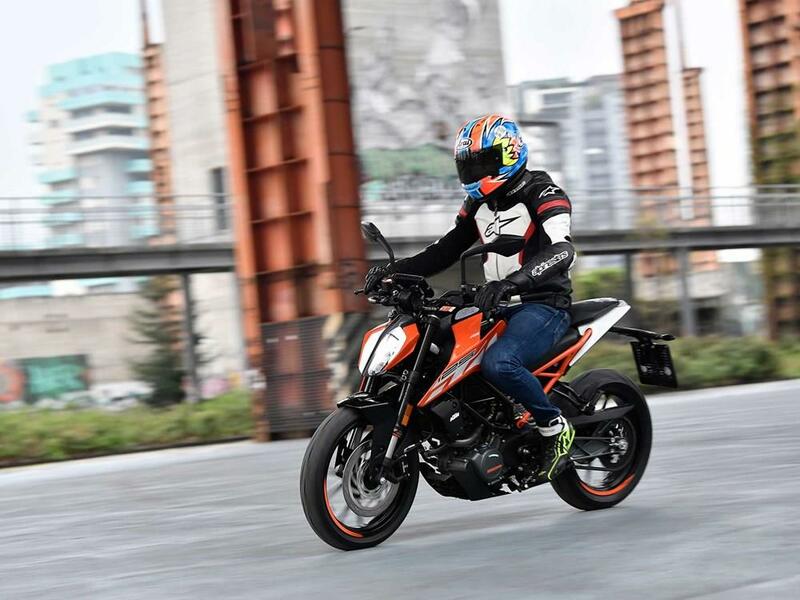 1 owner has reviewed their KTM 125 DUKE (2017-on) and rated it in a number of areas. Read what they have to say and what they like and dislike about the bike below. The only concern I have is the side stand is quite long and it sits quite upright which is very unnerving! The riding position is really comfortable. The breaks are spot on. In traffic it is really easy to manovoure and flick around. The power delivery is spot on and unlike a two stroke it has power almost in every rev range. In a week riding to and from college I cover over 250 miles and can easily do it one tank!  There are yearly services or services every 4000 miles. The TFT display is brilliant. Everything is clearly visible and the controls for it are very simple and easy to use. I bought the bike from gear4 and highly recommend anyone to go and have a look round!